Eric Carter, commander of the Sixth police district, addresses residents in Chatham after telling them Superintendent Garry McCarthy couldn't make it. Hundreds of people gathered inside a Chatham church Saturday morning for a Q&A session with police superintendent Garry McCarthy. But 15 minutes after it was scheduled to start, the featured guest wasn't there yet. "We understand our police commander is on the way," announced Roosevelt Vonil, president of the Greater Chatham Alliance, the community organization hosting the meeting. "Let's just hope the police aren't running this late the next time we have to call them for help." Several people laughed, others applauded, many nodded their heads, and just about everyone seemed to agree that Vonil's wisecrack cut to the truth. Some unsettling things have been happening in their neighborhood, and they wanted to know how much they could count on the police to help. For more than 50 years Chatham has been one of the country's best-known upper-middle-class black neighborhoods—a magnet for professionals and government employees who take immaculate care of their spacious bungalows and wide lawns. People lucky enough to be able to find and afford a home there tend to stay for decades. It's also a place where residents aren't afraid to pipe up when they don't think things are working. The wards that encompass the Chatham area are among the highest vote-producers in the city, often for independent-minded candidates. It's no surprise, then, that following a string of brazen crimes in recent years, residents have both fretted and mobilized, decrying the "outsiders" and "thugs" responsible, questioning the city's restrictions on gun ownership, ousting their longtime alderman, and pressing city officials for more police. Though crime totals for the police district that includes Chatham have declined from highs in the 1990s, many residents believe the stats don't tell the real story. Last summer police officer Thomas Wortham, who grew up in the community, was shot and killed outside his parents' home when two men tried to steal his motorcycle. In the middle of a Friday afternoon last month, police engaged in what they called a "gun battle" with two men suspected in a homicide minutes earlier. And a string of home invasions and robberies this summer reached a shocking new level of audacity a couple of weeks ago when 85-year-old Edward Alexander was held up at gunpoint as he watered the lawn of his home at a quarter till two in the afternoon. Alexander, a retired probation officer, slugged his assailant in the face. The thief's gun went off, shooting Alexander in the leg; the robber fled. Alexander has become a neighborhood hero. "He usually does have his gun with him," says Roderick Sawyer, alderman of the Sixth Ward, which includes much of Chatham. "If he had been going to his car instead of watering his lawn that day, there might be a dead punk we're talking about." Sawyer, son of former mayor Eugene Sawyer, won his seat in a runoff in April, defeating 13-year incumbent Freddrenna Lyle after pledging to improve public safety and bring residents together. He's now mulling a plan to create taxing districts called special service areas to raise funds for private security patrols in the neighborhood. "We're worried that people are trying to prey on the Chatham area and see it as easy pickins," Sawyer says. "These punks trying to take advantage of us—we have to let them know we aren't going to take it." MCCARTHY, MEANWHILE, has been making frequent visits to black neighborhoods since taking over as police chief in May. Charismatic and well-spoken, he has joined antiviolence marches on the southeast and west sides and addressed church groups in Chatham's neighboring communities of Auburn-Gresham and Park Manor. 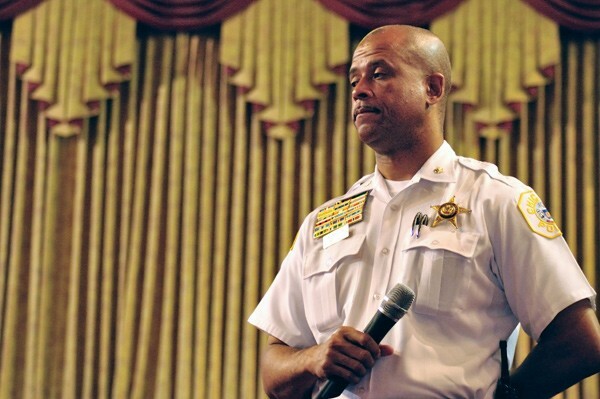 The police chief has spoken forcefully about the history of civil rights and tensions between police and the black community—while also remaining vague about what exactly will change under his leadership. In June, for example, he told congregants at St. Sabina in Auburn-Gresham that lax federal gun laws amounted to "government-sponsored racism," but managed to avoid discussing firearm policy in Chicago. All of this was the impetus for the Greater Chatham Alliance booking McCarthy in June: residents wanted to hear firsthand what ideas he could bring to their community. "I'm looking for new dialogue," Vonil, the GCA president, told me before the meeting. "I'm looking for the police superintendent to be tough but compassionate. I'm looking for police and community members who can work together." Vonil wasn't the only one. Among those who gathered at the Carter Temple church on 79th and Wabash were block club leaders, community policing volunteers, current and former city officials, clergy, popular WVON talk show host Cliff Kelley, Alderman Sawyer, and Officer Wortham's mother, Carolyn, who came to the church after leading a neighborhood peace walk earlier that morning. But by 11:30, a half hour after the start time, there was still no sign of McCarthy. The audience was growing restless. At 11:45, Vonil asked Alderman Sawyer to make a few remarks. And because the police superintendent was still supposedly in transit, "I want you to make it long, long, long," Vonil told him. By his own admission, Sawyer isn't much of a speech maker, but he did his best. He led a round of applause for Mrs. Wortham, then lifted up Alexander as a model for the community. "Mr. Alexander whipped this punk and sent him running," Sawyer said, to rousing applause. "We have that spirit here in Chatham." As he spoke, an entourage of police entered the church, led by Eric Carter, the new commander for the area's police district. He was quickly brought to the front and handed a microphone. Carter took a deep breath before he spoke. "Please allow me to extend an apology on behalf of Superintendent McCarthy," he said. "He cannot make it this morning." There were gasps and murmurs of disappointment from the audience. "Well, his credibility is shot," said Joseph Mason, a retired IBM executive and city colleges administrator sitting next to me in the pews. Mason chuckled when Carter promised that McCarthy would attend a future meeting. "Yeah, right." The sentiment seemed to be widespread. People were shaking their heads and venting to their neighbors. Some got up and left. Still, for the next half hour, Carter gamely fielded audience questions submitted in writing about police presence and crime trends. He said 40 beat officers had recently been redeployed to the district, which also had been selected as a pilot area for a new community policing strategy. But he didn't have any details about the new approach, which he said was still in development. And Carter was simply unable to respond to many of the questions and comments intended for his boss, such as his position on conceal-and-carry gun laws, the prospect of hiring more officers, and his commitment to the community: "We're not happy that we had a scheduled meeting and you disrespected us by being 35 minutes late," wrote one audience member, who had apparently submitted the comment a half hour before McCarthy's no-show was announced. Vonil did his best to remain professional, but he couldn't hide his frustration. "I scheduled this six weeks ago and reconfirmed it this week," he told the audience. There were a few other things he felt like saying, he continued, "but we are in a house of prayer." Afterward, Vonil told me he hadn't been given any clear explanation for McCarthy's absence except that the superintendent had encountered a scheduling conflict. When I reached a McCarthy spokeswoman, she wouldn't give me any details, calling it "a scheduling error that should not have happened." Vonil said he wouldn't be going out of his way to reschedule. "I'm not even going to call them," he said. "They can call me." On Monday, McCarthy did. "He said that whenever we could have him again, he'd be there," Vonil told me. "We all fall short of the mark sometimes."